Maybe it wasn't foreshadowing anything. Maybe it was, as coach Nate McMillan said, simply a matter of how the rotations evolved that particular evening. Maybe it won't happen again this season. Still, the fact Myles Turner and Domantas Sabonis finished Tuesday's 96-90 victory over Chicago together felt noteworthy at the time. Felt like it could be a sign of things to come. Felt good, too, at least to them. The Pacers' duo of 6-foot-11 22-year-olds were on the court for the final 6 minutes and 34 seconds against the Bulls, perhaps the longest they've ever shared court space and an amplification of the current trend in which McMillan has played them together more often. The results didn't give him good reasons to stop doing so, even if they weren't overwhelmingly positive, either. 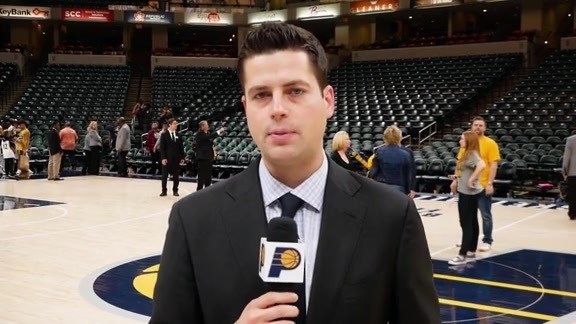 "Having your best defender (Turner) and your best rebounder (Sabonis) on the floor, it wasn't bad for us," McMillan said after the 96-90 victory over the Bulls at Bankers Life Fieldhouse. Coming from McMillan, that nearly qualifies as an enthusiastic endorsement. He's been fielding questions about playing them together since the middle of last season. It has become a tiresome topic for him, forcing him to continually repeat his belief that both are centers rather than power forwards, and that having them in the game together exposes one of them – usually Sabonis – as a poor defender of smaller and quicker players on the perimeter. Still, it remains an intriguing concept, given their mutual size, youth, and skill sets. A deep dive into analytics provides an argument that Sabonis is the best player on the Pacers' roster, Victor Oladipo included. Bringing someone that effective off the bench for 25 minutes a game seems inadequate. Turner's recently improved play only fuels the belief they should play more together. The question becomes whether they can fit into a successful five-man lineup combination. This season's trend is encouraging, yet inconclusive. Last year, Turner and Sabonis played together for 269 minutes. The Pacers were outscored by an average of 9.9 points per 100 possessions during that time and were particularly poor on defense. This season they have already played together 126 minutes. The Pacers have outscored opponents by 0.8 points per 100 possessions in those minutes, and while their offensive rating is virtually the same as last season, their defensive rating is greatly improved. It's too soon, however, to declare the defensive concerns resolved. Tuesday's game against the Bulls provided adequate proof of the mixed bag the pairing brings. The Pacers outscored the Bulls by just three points in the combined time Turner and Sabonis played together in the game. Over the final 6:34, the two teams played to a draw. The Pacers were up six points when Sabonis replaced Thaddeus Young and joined Turner in the lineup, and they were still leading by six at the final buzzer. McMillan said he reunited them for the grand finale because Young had played the entire fourth quarter to that point and needed a break. McMillan previously had leaned toward keeping Turner and Sabonis together only when the opponent played two traditional "bigs," but now is more willing to see if the advantages on offense outweigh what appears to be shrinking disadvantages on defense. Having them both on the court for the finish against the Bulls, he said, "gave us something." "We just tried to take advantage of whichever small was guarding those guys," he said. "It gave us some opportunities that were good for us." And it didn't hurt them much on defense despite Chicago's "small" lineup. Turner hustled over to get a piece of Lauri Markkanen's 3-point attempt from the left wing with 5:07 left after Sabonis had switched off of him. But Markkanen later hit a 3-pointer from the right corner over Sabonis, who had dropped off to help pick up Justin Holiday's penetration and didn't get back to the agile 7-footer in time. The primary benefit of the pairing, rebounding, was evident when Bojan Bogdanovic missed a 3-point attempt but Sabonis grabbed the rebound over Jabari Parker and drew a foul. Darren Collison hit a 20-footer after the Pacers inbounded the ball, giving the Pacers a five-point lead with 2:11 remaining. He had 16 points while hitting 7-of-8 field goal attempts along with four assists, two steals, and two blocked shots – all in barely more than 25 minutes – against Utah. He had 16 points on 6-of-10 shooting along with 13 rebounds, five blocks, and the game-clinching 3-pointer the following night against Phoenix. After a sub-par game against the Lakers (he hardly was the only one) he had 14 points, 12 rebounds, four assists, and three blocked shots against Sacramento. He followed with 18 points, 11 rebounds, and five blocked shots against the Bulls. Four of his blocks came in the second half, and some of them were of the acrobatic variety. Not only did he deflect Markkanen's 3-point attempt, he met Holiday in front of the basket to block a dunk attempt, got a piece of a surprised Zach LaVine's reverse layup and came from the weakside to snuff out Markkanen's driving layup. He's also grabbed double figure rebounds in three of the previous four games, after needing 16 games to do it the first time. It's not only the numbers, though. The eye test reveals a more aggressive player as well, one willing to mix it up. "Just playing hard, man," he following Tuesday's victory. "I've made a focus of that these last few games, just going out there and leaving it all out on the floor. That's one of the things that got me in this league. I'm not saying I hadn't been playing hard, I just haven't put a lot of focus on (rebounding) like I used to." Sabonis was difficult to find after Tuesday's game. He went to a private area to be massaged and stretched immediately after McMillan addressed the team. That's his routine, but more important now than ever because of the back injury he suffered in the loss to the Lakers last week. 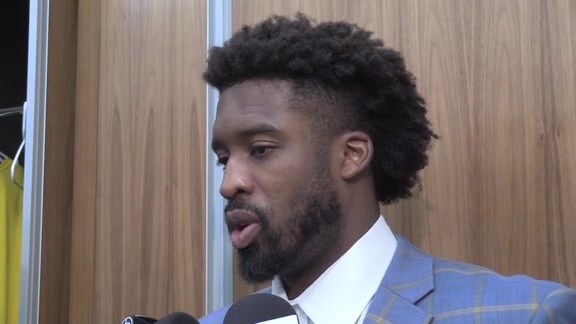 After stopping briefly at his locker, he headed for the cold tub, where two patient reporters caught up with him following what had been his version of a subpar performance: nine points, 11 rebounds, three steals, and four turnovers in 28 minutes. Even when one of them is compromised physically, they combine to give the Pacers All-Star production at the center position. Turner is an elite shot-blocker and a respectable mid-range shooter. His 3-point percentage (.206) has dropped drastically from last season (.357), but logically figures to improve. His recent rebounding surge makes him that much more of a threat. Sabonis, meanwhile, is the Pacers' best low-post scoring threat, by far their best rebounder and at least as much of a 3-point threat as Turner. He hit 35 percent of his 37 3-point attempts last season, and is 5-of-6 this season. 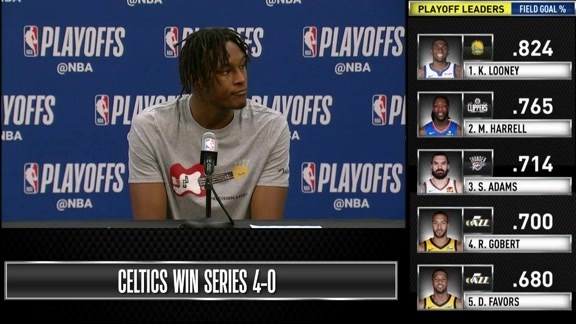 They make for an interesting combo platter, and if they can mesh within a productive five-man lineup they'll provide the sort of unique asset that brings postseason advancement. Finding out, however, takes minutes from Young, a co-captain and glue-guy contributor, and could limit the minutes the best shooter, Bogdanovic gets at the "four" position, where he's been the most effective. It's not difficult to see why McMillan hasn't gone all-in on the experiment. But both Turner and Sabonis are eager for the experiment to continue. Told on Tuesday that he and Turner had just finished a game together for the first time, Sabonis smiled despite his stiff back and the cold water in which he was sitting. "I'm happy we won, then," he said. "That's a good sign. "That's the only way for us to learn and improve. Everybody says they want us to play together, but if we don't practice it, it's not going to happen. The more we get these extra minutes together, it's going to help us." The long-term question, however, remains unresolved: will it help the team?